Well, I jumped on the eclipse technique with everyone with this CASE'd card from Joyce Hunt. 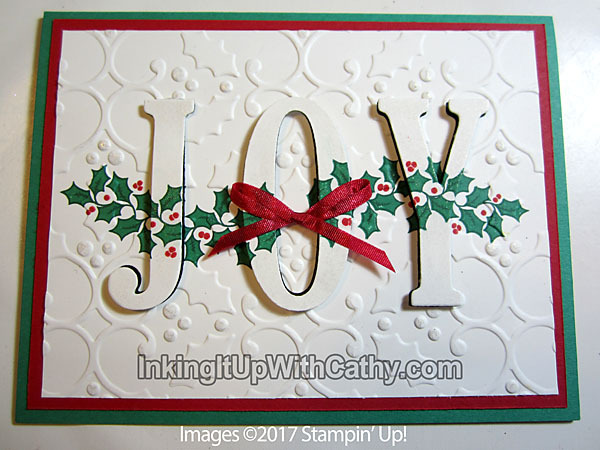 I ended up adding the Holly embossing to the back of the card, leaving the word JOY smooth. I have seen a number of these cards using a black piece of card stock behind the white portion and the letters raised up on dimensionals. While in Virginia at Rose-Ellen Eastman's Regional-style event for demonstrators, we decided to try using black fun foam. The thin fun foam compresses enough to cut perfectly with the dies. A warning - be careful when removing the foam from the dies if they stick. They can tear easily. Remember to save the center of the letter "O" and emboss that along with the card front! 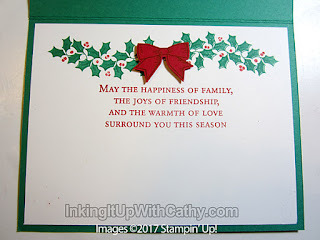 In order to get some contrast with the outline of the holly and bow, I used Tranquil Tide and Cherry Cobbler for the outline and Emerald Envy for the center of the holly. I loved returning back to this stamp set from last year's Holiday Catalog. I fell in love all over again. I hope you do too!